The project consists in comparative studies of differing reception models not only across Europe but also America, Australia & New Zealand and in parts of the world not commonly associated with Graeco-Roman tradition: Africa and Asia. Principal investigator (PI): Professor Katarzyna Marciniak (kamar@al.uw.edu.pl). Description: The search for the development of a standard Cameroonian variety of English that is comparable with the standard varieties of English in other countries and that can be regarded as the norm of educated usage and a model for English teaching and learning in Cameroon has been the major pre-occupation of linguists working to document distinctive features of Cameroon English (CamE) in the past several years. One way of achieving this objective is to rely on the capacity and potential that modern computer-based language corpora offer. Within Cameroon, an electronic database of written English already exists. But because this database is not linguistically annotated, descriptive studies of the type needed to meet the above-stated goal have not been possible. The aim of the project was to annotate the one-million-work corpus (general purpose) and an equivalent academic writing corpus (specific purpose) of Cameroon English text. 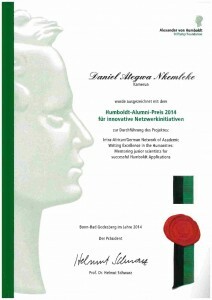 In June 2014 was awarded a Humboldt Alumni Prize for Innovative Network Initiative with a project entitled: “Intra-African/German Network of Academic Writing Excellence in the Humanities: mentoring junior scientists for successful Humboldt applications”. Description:This network of five African countries (Cameroon, Nigeria, Ghana, Kenya, and Tanzania)and Germany aims to raise awareness of the Humboldt scholarship opportunities, to junior scientists within the university communities; and to create a platform to mentor them, in view of optimizing their chances for successful Humboldt applications in the short and long run. The network involves 8 universities and alumni (senior and junior scientists) in linguistics, literatures, history, law, philosophy, germistik, and performing and visual arts. 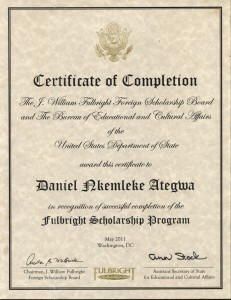 In September 2010 obtained a Senior Fulbright grant to tag a spoken corpus of Cameroon English at the University of Massachusetts at Boston. Description: This project transcribed and annotated parts of a 100,000-word corpus of Cameroon spoken English texts available on CD-ROM, using computer software and manually. The project is part of a wider corpus linguistic research enterprise started by the Department of English of the University of Yaoundé I in 1992. 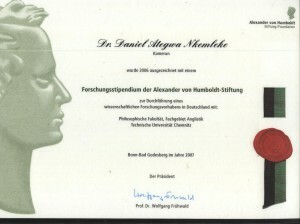 This database is intended to be a complement to the existing one-million-word written corpus compiled 16 years ago, and which I developed in Germany with a grant from the Alexander von Humboldt Foundation (Nkemleke 2008). The corpus will be useful for language research, teaching and learning in universities in Cameroon and abroad, especially among our ICE (International Corpus of English) project partners. A major benefit of the project for Cameroon is technology transfer in the area of computer-based linguistics, especially future text processing via software.